This is the last in a series of articles examining the role of representing children in family court actions. In the first article, I discussed the dispute between the ABA Family Law Section and the ABA Litigation Section regarding a lawyer serving in a non-traditional role by representing a “concept” of best interests, rather than representing a client. In the second article, I discussed the role of the GAL in Wisconsin and some of the issues associated with the evolution of that role. In the third article, I discussed some roles for a GAL, other than the role in Wisconsin. In this, the final article in the series, I will discuss what the role of a child’s representative would be in a perfect world. The Litigation Section position is that, simply put, lawyers should be lawyers. Lawyers are not psychologists, child specialists or super-experts on custody and placement. Therefore, the investigatory role of a GAL is a lawyer performing a non-lawyer’s role. This misfit of role and training is heightened by the proclivity of courts to rubberstamp the GAL’s recommendation. There are, in fact, a number of cases where appellate courts have had to warn trial courts that the recommendation of the GAL is just that — a recommendation and not evidence in and of itself. See In re Paternity of Stephanie R.N. 174 Wis.2d 745, 498 N.W.2d 235 (1993); Goberville v. Goberville, 2005 WI App 58, 280 Wis. 2d 405, 694 N.W.2d 503. 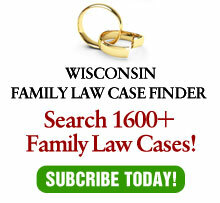 In fact, in the original slip sheet opinion in Goberville, the Wisconsin Court of Appeals referred to the GAL’s “report,” a word they removed from their final decision after I wrote the court, with the aegis of the State Bar Family Law Section, pointing out the problems such a word would cause. Eliminating a child’s representative may be even worse. Trial courts want to do the right thing for children. Yet, of everyone in the courtroom, the judge knows the least about the case. The rules of evidence are not well-formulated to provide sufficient information and knowledge to the court, as they tend to limit the facts the court is entitled to consider. Every county should have a staff of social workers that perform custody and physical placement evaluations. Staff should be sufficiently funded to avoid backlogs. The GAL should work in tandem with the social worker to formulate an opinion, with the social worker performing the evaluation. The GAL should represent the family court counseling service in court with the roles and responsibilities of a lawyer. Where a child is of sufficient age and maturity, and desires to have his or her wishes represented, either the GAL should serve in the role of advocacy counsel or ask the court to appoint advocacy counsel. To serve in the role of GAL, a lawyer should be required to have undertaken training, which would include the role itself, child development issues, the effect of domestic violence on children, recognizing signs of abuse and cultural distinctions. The GAL should be adequately compensated for his or her services. It is simply not right that the parents pay their lawyer substantially more than the court allows for the GAL. Trial courts should monitor the performance of GALs, by seeking feedback from lawyers and/or litigants. GALs who do not adequately perform their role should not be reappointed. There should be guidelines promulgated which provide a template for the services of a GAL. Such guidelines were, in fact, adopted by the State Bar Family Law Section some years ago, but seem to have disappeared. The leading drawback to this scenario is funding. In many cases, serving as a GAL is a form of pro bono work. Is it too much to ask that sufficient funds be provided for training, monitoring, social service workers and maybe additional (advocacy) counsel for children caught in the crossfire between parents? When the role is so important, one would hope the answer is no. In a real world, of course, children have no lobbying voice in Madison. As a result, this funding will never happen, so this perfect universe will never exist. Isn’t it nice, though, to think the world were otherwise?